Flex Your Brand, Go Digital! Digital billboards are nothing new, but they are growing in popularity and for good reason too. As a next generation platform for advertisers, digital boards allow businesses to interact with consumers, create custom content and make maximum impact. Traditionally speaking most billboards you see are still vinyl, BUT if you are looking for more flexibility and versatility then digital billboards may be a viable option. With digital boards you can schedule different ads to run at different times, even create several ads to rotate. 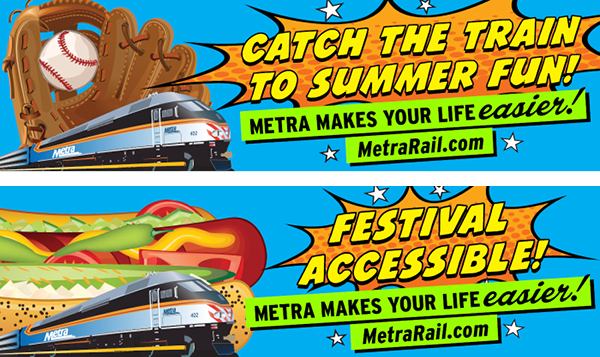 We successfully used this media approach for Metra’s 2014 Summer Campaign in Chicago. By rotating several boards Metra is able to reach a variety of consumers with different messaging thus expanding their marketing efforts and potential ridership threefold. If you’re interested in flexible outdoor advertising or simply intrigued please drop us a line. We are always developing new and creative ways to improve our clients marketing efforts!